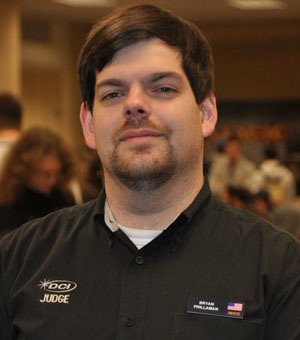 Bryan Prillaman has been playing Magic since Antiquities, and a has been a Judge since Worldwake. In real life he is single father of a beautiful little girl and a Systems Engineer by trade. In Podcast Land, Bryan was a host of the now defunct Avant-Card Show, and occasional guest host on other podcasts on the Mtgcast.com network. Bryan is older than the stereotypical judge and tends to drone on about tangents pertaining to 80s cartoons and the Iran-Contra scandal, and has earned the nickname “Mossy.” He is personally responsible for every JudgeCast episode being longer than an hour. But deep down, in places you don’t talk about at parties, you want him on that podcast; you need him on that podcast. Bryan can be contacted via email at bprill.mtg@gmail.com or via IRC on EFNET as bprill. He also lurks on JudgeCast’s Facebook and Twitter accounts, so just throw up the bro-signal, and he will come running. Jess started playing magic in Odyssey block and then took a long break between Onslaught and Time Spiral, picking up magic competitively in Lorwyn. He was an inveterate Planeswalker Points grinder until recruited by ChannelFireball.com. After a couple of years as their Events Coordinator, he moved to Alabama to go back to school. For now, you’ll see him at GPs and PPTQs either playing or judging when he has time. You can follow him on Facebook or twitter @TheSlamDunks. Brogan started playing Magic during Innistrad because horror movie tropes were the only thing that could convince her to slog through learning an entirely new game. 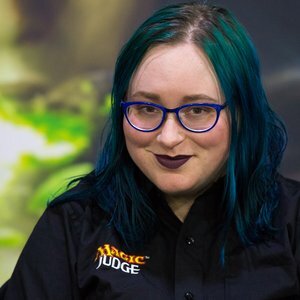 She started judging in January 2014 after befriending the local judges in Boston and realizing that judging had all the benefits of playing Magic without having to deal with variance. Now that she’s in Richmond, she is acting as the Level 1 Testing Coordinator for the Mid-Atlantic and helping grow the local community. When not judging, she will argue with you ceaselessly about what constitutes a good indie game and why brussels sprouts are an underrated food. You can find her at twitter.com/vaearen, twitch.tv/vaearen, and roughly any time on Facebook.